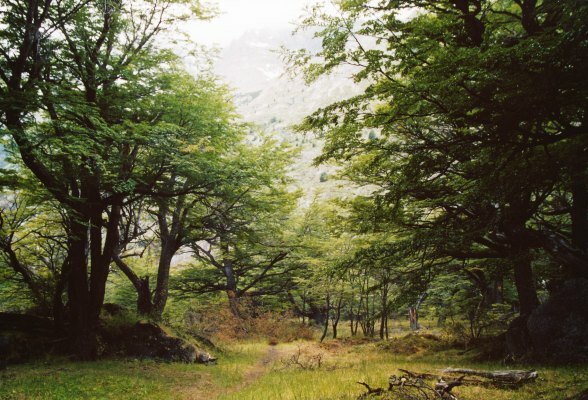 Chile’s Torres Del Paine walk is a 58 km route that makes the Patagonian wilderness accessible to the average walker. The scenery: icebergs, glaciers, towering mountains and the famous Torres del Paine (Towers of Paine) make this a wonderful walking holiday. The walk is usually done in 5 days. In planning an itinerary, some of the considerations in determining the distance for each day should include the type of terrain, the accommodation, weather, the time of year and how fit one is. The following is an outline of the 5-day walk itinerary that we chose. We decided on this itinerary because this is the traditional journey, the reasonable distances and the available accommodation. Begin at: Puerto Natales, Chile. How to get there: A bus or mini bus will take you to the National Park’s entrance. From there you will be transferred to Hostel Lago Grey and then taken by ferry across Lago Grey to Refugio Grey. Bus from Puerto Natales to Torres del Paine National Park. Ferry along Lago Grey to Refugio Grey. Walk to Paine Grande (lodge) (11km 4hrs). Walk to Camp Italiano (7.6km 2hrs). Walk (round trip) to Camp Britanico (11km 5hrs). Walk to Refugio Cuernos (5.6km 2.5hrs). Walk to Refugio Chileno (12km 5hrs. Walk to base of Torres (round trip) 4hrs. – your destination! Walk to Hosteria Torres 2hrs. Take bus back to Puerto Natales. How to get back from Hosteria Torres: A bus will transfer you to the Park entrance, from where you take a bus back to Puerto Natales. This is a once in a lifetime Patagonian experience. Couple this walk with a general visit to South America and you have a great journey ahead of you.